Last week saw the launch of a PlayStation Mobile promotion that will offer six free games over six weeks, starting with Samurai Beatdown. This week, the free PlayStation Mobile game is Beats Slider. 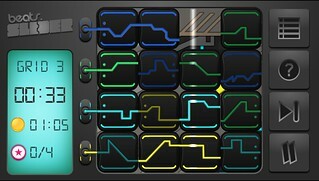 Master the puzzle gameplay by sliding different note blocks into sequences to create catchy electro tunes and compete for the best times online! 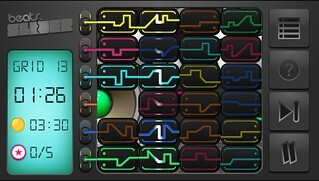 Each block of the sliding puzzle represents MIDI data, which is basically musical notation that computers can read. MIDI data can be used to play back any instrument, synthesizer, drum loop or whatever you throw at it, just by changing the instruments or samples that are triggered by it. So what we’ve done is allow the player to push a drum loop MIDI pattern into a synthesizer slot, or a melody pattern into a bass line track, and every combination you could think of within the limits of each level. It was quite the brain teaser to write music that can be rearranged in this way whilst still sounding good, but we managed it. What we’re also doing is teaching people how to solve those blasted slider puzzles. Some people are just able to solve them, but people like you (and me) are often left frowning with frustration. No more. If you play Beats Slider, you will learn how to solve every slider puzzle that will ever be made, whilst also listening to catchy music like this. Find out for yourself starting today – and at no cost! PS Vita owners will be able to download Beats Slider for free on the PS Mobile section of PlayStation Store; Owners of PlayStation-certified devices (see the full list here) can obtain it through PlayStation Mobile Store – click here for full instructions. Check back next Wednesday to learn what new free game you’ll download next! Need more information on PlayStation Mobile? Want to know more about supported tablets and phones? Head here. I download yesterday, this game is very cool, please, make more games like this. Thanks for this free games. We, too, are excited about all of the cool games coming to PlayStation Mobile. We love playing these kind of games as much as you do! 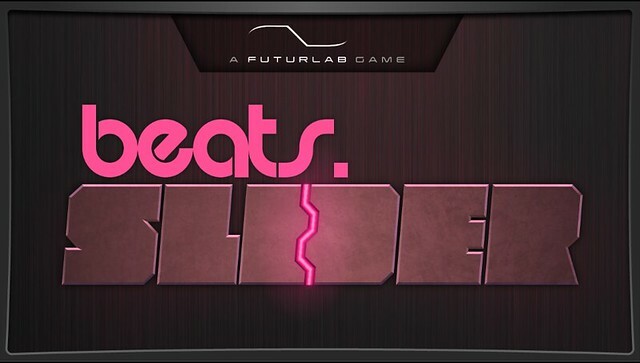 We’re constantly working to find more great games like Beats Slider. I enjoyed Samurai Beatdown even though it lacked more levels,but it was still better than Tap Tap, imo. Can’t wait to try Beats slider & thanks for the freebie. My only question is, will this be 63MB as well? Still a good slide puzzle game if you’re a fan, though. Trophy support psmobile team ASAP. @ZaGe-zAiKaNo I believe it was less than 50mb. One of our main goals with PlayStation Mobile is to offer a wide variety of great games of all levels, types, genres, etc. So, even if this game was a little challenging or not your cup of tea. Be sure to check back and see what PlayStation Mobile game we have free next Wednesday. @BlueBl1zzard I did. Although, it did take me a few tries, then thought of an “Easy” solution to make it easier. Downloaded it last night, but haven’t touched it yet due to Ni No Kuni. I want to try it looks fun. May I suggest adding some type of (Internet Spades) or (Mobile Spades)? M sure many will purchase this even if it’s not part of the free 6, and u actually had to pay. @5 Yeah, I got those trophies, but I spent a good couple of afternoons on them. When I first bought my Vita I didn’t buy any games for it, so I was determined to earn all the trophies I had access to. :P This was before Motorstorm RC, too. Is this a full game for free or just the base game, like Lemmings? I hope to see Alien Breed to be among those free game sometime. If you like this game make sure you try out FuturLabs’ game Surge. Lots of fun. I downloaded this one but haven’t tried it yet. Can’t lose on the price though. Since the iPhone is not Playstation Certified, I’ll never get those games. Sony, you could make money out of me if you could certify the iPhone… Launching an app on the iPhone isn’t hard… Anyway. I tried this one out and couldn’t really get into it, but this free game a week thing is just amazing. Excited for next week! thanks again for doing this! hoping to get at least one of super crate box, aqua kitty, and haunt the house in the coming weeks. Those are the other psm titles i’ve been thinking about. Downloading it as I write this! Looks pretty good! I downloaded the Ps Mobile games,but ihaven’t tried it yet. Fun, addicting little game. Really enjoy the music too. Sweet, snagged it this morning. Cool game, thanks!! Liking this deal of free PSM games while it lasts, just hoping now that Life of Pixel isn’t on the list to be free now that I bought earlier this month. Oh well, I guess if it is, it’s still supporting the people behind it. Am i being punished for supporting ps mobile? While I do appreciate this offer and the game, I did not enjoy playing this. I get the concept just wasnt fun to me. Not going to make every person happy I know, just stating my opinion. Can’t access PlayStation Mobile content from the PlayStation Web Store, nice Sony, of course. Is anyone else having trouble downloading this from their Vita? I’m getting error NP-2243-1 over and over again.. on like, everything. Okay well I got it working – but it’s not free anymore – it says it’s supposed to be free until Wednesday, what happened? Thanks a lot in advance!